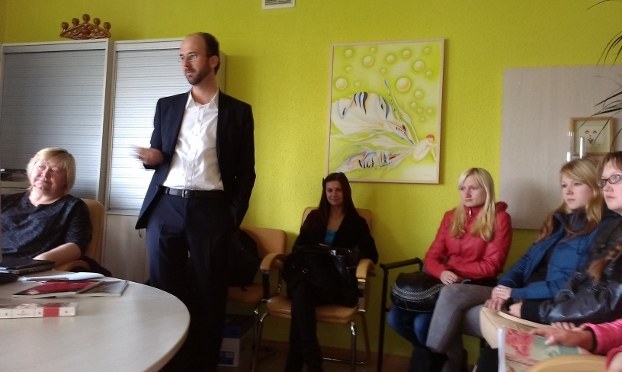 On November 5, 2014, ISE and UNESCO staff members at Daugavpils University had organized an academic discussion with Dr. Daniel Fischer who is a senior research fellow at the UNESCO Chair in Higher Education for Sustainable Development at Leuphana University Lüneburg (Chairholder is Prof. Dr. Gerd Michelsen). He is a trained primary and secondary school teacher himself, holds a Masters degree in educational management and school development and completed a PhD on the contribution of schools to meet the global consumption challenge on the margin of educational and sustainability science. Dr. Fischer has researched, published and lectured extensively in the fields of education for sustainable development, sustainable consumption and sustainability communication. He is currently visiting Latvia as an ERASMUS guest lecturer at the University of Latvia in Riga. The work of the UNESCO Chair in Higher Education for Sustainable Development (HESD) focuses on the question in what way sustainable development may represent a guideline for higher education and how this principle may be implemented into sustainability-related research activities. In September 2015, the UNESCO Chair in HESD will host the 5 th International UNESCO Chair Conference on HESD in Lüneburg. Leuphana University of Lüneburg is a dynamic university in Northern Germany that has dedicated itself to addressing the challenges of civil society in the 21st century in its course work and research initiatives. In its mission statement, the university commits to the principles of humanistic, action-oriented andsustainable education. Leuphana University of Lüneburg’s academic initiative on sustainability research considers sustainability studies as one of the most important fields of activity for developing a civil society in the 21st century, in which academic knowledge, ethical standards and practical action are in harmony with sustainability development. The academic initiative on sustainability research is pioneered by a Faculty of Sustainability that combines natural sciences and the humanities with more than 25 professorships. The academic discussion was a fruitful venture for the all the participants involved, since we have shared the best practice in pursuing sustainability agenda in practice as well as discussed about the further cooperation possibilities.